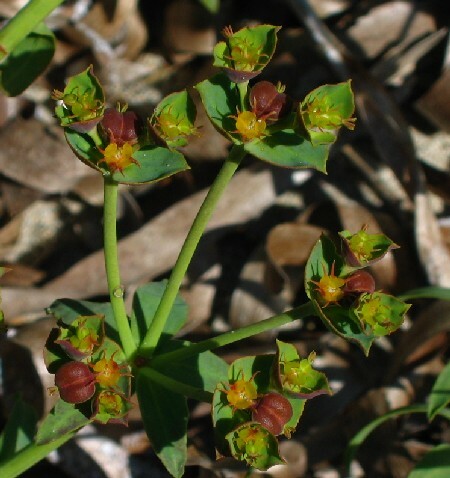 ﻿ Euphorbia terracina (Coastal Spurge) : MaltaWildPlants.com - the online Flora of the Maltese Islands. Dry sandy ground, often near the sea. Glabrous perennial; stem up to 70 cm, simple or branched from the base and with 0-5 axillary rays. Leaves 15-40(-55) × 4-7(-11) mm, linear-lanceolate to elliptic-oblong, rarely (var. angustifolia Lange) 1•5-2 mm wide, linear, minutely serrulate. Ray-leaves resembling the upper cauline. Raylet-leaves deltate-rhombic, sometimes slightly asymmetrical, occasionally coarsely serrulate. Rays 4-5, up to 5 times dichotomous. Glands with 2 long, slender horns. Capsule 3-5 × 4-5 mm, deeply sulcate, smooth. Seeds 2-2•5 mm, ovoid, pale grey. Mediterranean region, extending to N.W. Spain and Portugal.